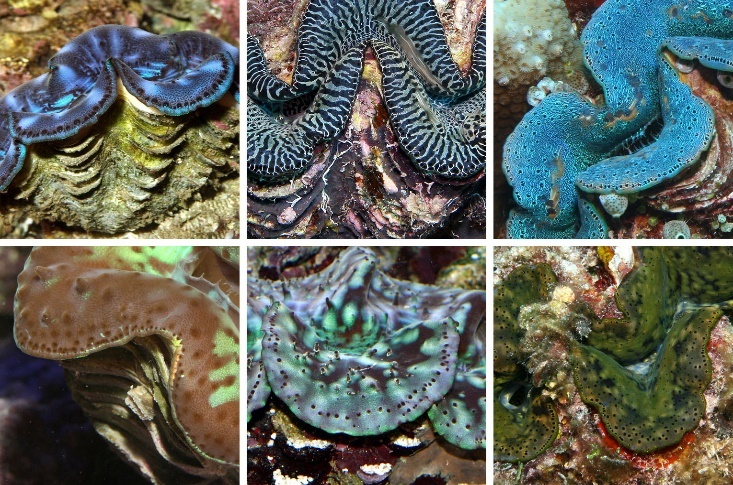 When Giant Clams in the Sea and the Aquarium (Fatherree, 2006) was published, seven species of giant clam had been imported for the US reef aquarium hobby. However, since that time T. mbalavuana has been imported in small numbers, and three new species have been described. I’ve already covered T. mbalavuana and T. squamosina in a previous article (www.advancedaquarist.com/2015/3/inverts), which was the first newly described species. So, now it’s time to look at the other two new species, which are Tridacna noae and T. ningaloo. I’ll give you a bit of a spoiler before getting started though, as it turns out that T. ningaloo isn’t a new species after all. This may be somewhat confusing at first, but it should make sense by the end. Given the common name Noah’s giant clam, this species was actually described and named T. noae in 1798 (Röding, 1798). However, Rosewater (1965) thought it was only a variant of T. maxima based on its shell structure, and T. noae subsequently lost its status as a unique species. More recently, several other researchers looking at shell morphology, mantle patterns, and genetic evidence suggested that it is indeed a unique species after all, and it is now accepted that T. noae is not a variant of T. maxima (Tang, 2005; Kubo & Iwai, 2007; Su et al., 2014; Borsa et al., 2014; Borsa et al., 2015). Oddly enough, if you’ve looked at many giant clams, there’s a good chance you’ve already seen T. noae. In fact, you might even have one in your aquarium. Giant clams that have been called “teardrop maximas”, due to the presence of numerous oval spots on their mantle that are bordered by a thin ring of gold to white, are now T. noae and are no longer T. maxima. 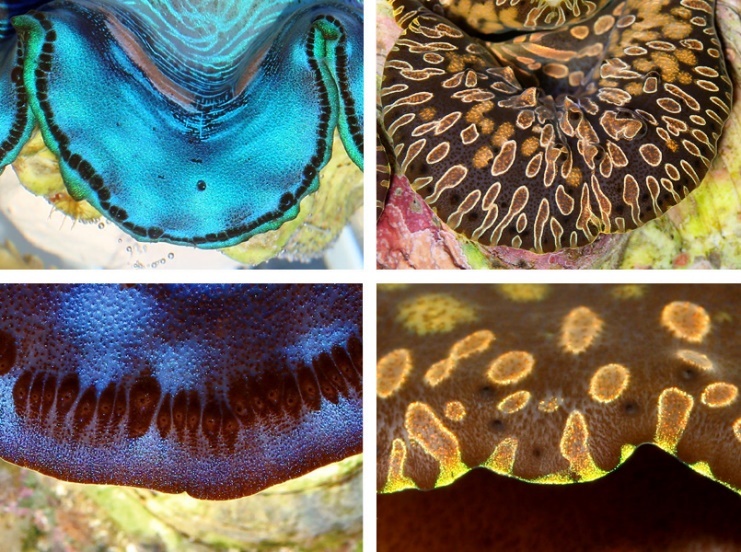 So, there will have to be a change of common names in the hobby and elsewhere, as these teardrop maximas should now be called Noah’s giant clams, or just teardrop giant clams. Anyway, let’s get into some of the details. These are several examples of clams previously thought to be teardrop varieties of T. maxima, which are now known to be T. noae. For starters, the geographic distributions of T. maxima and T. noae have significant overlap, and the two species can be found living in the same local areas, at times. T. noae has been found in the South China Sea, Sulawesi Sea, Bismarck Sea, Sawu Sea, Coral Sea, Molucca Sea, and in waters around the Phillipines, Taiwanese and Ryukyu archipelagos, Caroline Islands, New Caledonia, Fiji, Wallis Island, Northern Line Islands, Solomon Islands, the Great Barrier Reef, and Ningaloo Reef, all of which are within the extensive range of T. maxima, with the possible exception of Ningaloo Reef (Huelsken et al., 2013; Borsa et al., 2014; Allan van Zijl, Perth Marine Giant Clam Aquaculture, written comm., 2015). Of course, both species may be found in additional localities in the future. Still, after looking at hundreds of these clams, I can say that T.maxima most commonly has only 4 prominent ribs, occasionally has 5, and very rarely has 6, while T. noae most commonly has 6 prominent ribs, occasionally has 7, and has a relatively elongated shell. Unusual specimens of T. noae can be found that are quite short though, as well as intermediates that span the forms (Phil Dor, Tridacna Mariculture Development Consultants, written comm., 2105). These are typical shells of T. maxima (L) and T. noae (R), showing prominent ribs and scutes. Likewise, Su et al. (2014) noted that the petal-like scutes that protrude from the ribs of T. maxima shells are generally more rounded and more closely-spaced than those of T. noae, but that’s only generally. As above, the shape and spacing of the scutes of both species are highly variable, and in some cases they’re practically absent. Thus, the nature of the scutes is also a poor identifier, and there is no obvious feature of the shell that is definitively unique to either of the two species. The shells of both species are variable in form. Pictured are a rather elongated T. maxima (TL), a typical T. maxima (BL), a typical T. noae (TR), and an unusually short T. noae (BR). Next, we get to the distribution and form of their simple eyes, as these are typically significantly different. Most T. maxima have a continuous row of tightly-spaced and pronounced eyes that run around the entire periphery of the mantle, and also have other eyes scattered about the rest of it. However, while T. noae also has some eyes scattered about mantle, it typically has fewer eyes around its edge, and they’re usually well-spaced relative to those of T. maxima. The eyes of T. noae also look more like small black dots or dimples on the mantle and are not as well-pronounced as those of most T. maxima. Still, some T. maxima have a broken-up band of eyes around the periphery of the mantle, and oftentimes have dimple-like eyes similar to those of T. noae. So, as is the case with the shells, the eyes are usually significantly different between the two species, but not always. T. maxima typically has a row of tightly-spaced, pronounced eyes lining the periphery of the mantle (TL, BL), whereas T. noae typically lacks a distinct row of eyes (TR). The eyes of T. noae are typically more like small dimples in the mantle, as well (BR). The eyes of T. maxima are variable, as pictured here. While they commonly form a row around the periphery of the mantle, they are sometimes more spread out, and are sometimes dimple-like, as well. The eyes of T. noae are also variable, as pictured here. Note that some specimens do have rows of closely-spaced eyes that partially, or even completely, line the periphery of the mantle. Okay, now let’s get back to the appearance of the mantle and those teardrops. The mantle of T. maxima displays incredibly diversity, bearing various shades of all the colors of the rainbow, as well as black and white, and are typically covered by spots, splotches, and lines. Those of T. noae are also highly variable, except that they’re at least partially covered with oval spots that are oftentimes significantly lighter than the mantle’s background color and are circled by a thin ring of even lighter color, usually being rather gold to white. On the other hand, T. maxima always lacks these teardrops. While both species vary in appearance, only T. noae bears these teardrop markings on the mantle. Lastly, we get to the genetics. I won’t pretend to know a lot about the 16S rRNA, 18S rRNA, 28S rRNA, COI genes, and mitochondrial DNA testing and statistical evaluation methods used by the researchers studying giant clam genetics, but I can say something about their findings. When looking at genetics, at times outward appearances can be deceiving. While T. maxima and T. noae can have overall appearances similar enough to be considered the same species, their genes say otherwise. Apparently, the genes of the two show characteristics that make them fall into two distinct evolutionary groups, or clades, which is enough to verify that they’re separate species regardless of what they look like. In fact, the genes indicate that it has been millions of years since T. maxima and T. noae even shared a common ancestor (Borsa et al., 2015). So, I’ll leave it at that. If you’re interested and have the background knowledge, everything is covered in Su et al., 2014; Borsa et al., 2014; and Borsa et al., 2015, though. While its full geographic range hadn’t been determined, it was found from waters off western Australia eastward to the Solomon Islands, and as far north as Taiwan (Huelsken et al., 2013). And, as above, these locations fall within the range of T. maxima, with the exception of the Ningaloo Reef area. In the past, it was thought that T. maxima did live there, but it turns out that all of the clams from the area that were thought to be T. maxima aren’t T. maxima. 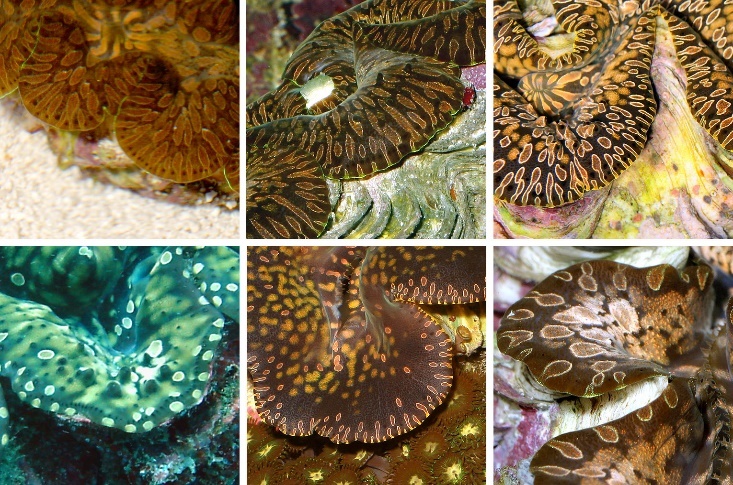 These are several examples of clams previously thought to be varieties of T. maxima around Ningaloo Reef, which were determined to be T. ningaloo. Images used with permission, courtesy of Darren Gebbetis, Ningaloo Aquaria. As is the case with T. noae, the shells of T. ningaloo are also variable, and sometimes look essentially the same as those of some T. maxima. However, while T.maxima almost always has 4 or 5 prominent ribs, T. ningaloo was reported to have 5 (Penny & Willan, 2014), and I’ve seen images of some that appear to have 6. Images of T. ningaloo shells I’ve looked at also show that they’re commonly elongated more than a typical T. maxima shell, but less than a typical T. noae shell. Other than that, the interdigitating projections along the upper edge of the shell of T. ningaloo apparently always become quite pointed with growth, whereas those of many T. maxima are less pronounced and more rounded. These are shells of T. ningaloo, which obviously look quite similar to those of T. maxima andT. noae, having prominent ribs lined with scutes. 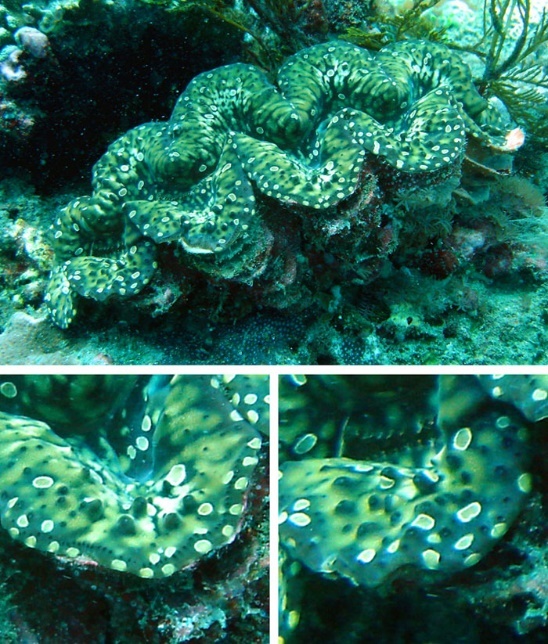 Images used with permission, courtesy of Allan van Zijl, Perth Marine Giant Clam Aquaculture (L, C) and Darren Gebbetis (R). When it comes to the mantle of T. ningaloo, colors/patterns are obviously highly variable. However, its surface is quite bumpy and covered with numerous small lumps and protrusions. These structures, which are properly called papillae, become more numerous and increasingly pronounced as specimens grow, as well. While the mantle of T. maxima and T. noae tends to be relatively smooth, there are some papillae on some specimens of both though (you can see some in the images of their eyes above), so it’s a matter of quantity. In other words, the mantle of a typical T. ningaloo is covered with papillae, while those of some T. maxima and T. noae have a few. Much like typical specimens of T. maxima, T. ningaloo also has a continuous row of pronounced eyes that run around the entire periphery of the mantle, and also has other eyes scattered about the rest of it. Those along the periphery are typically relatively tightly-spaced, as well. Yes, all of these clams share some common features! The mantle of T. ningaloo is covered with papillae, which typically become increasingly prominent with age. Every specimen I’ve seen also has a continuous row of eyes that run around its periphery. Images used with permission, courtesy of Phil Dor, Tridacna Mariculture Development Consultants (L) and Allan van Zijl (C, R). The last thing I’ll say here is that T. noae is a relatively common offering, but to the best of my knowledge T. ningaloo is not available the US at this time, as shipping costs from Western Australia are rather prohibitive. A few have been imported in the past though, and recently a clam farmer in Australia has successfully reared this species in captivity (van Zijl, written comm., 2015). So, their relative absence in the hobby may change in the future. Well, above I said when looking at genetics, at times outward appearances can be deceiving, and that’s the case again. As it turns out, despite the apparent differences between T. noae and T. ningaloo reported in the literature and seen above, their genes say they’re the same species (Borsa et al., 2015). When I started reading about and looking over images of T. ningaloo and T. noae, I noticed something peculiar, and I wasn’t the only one. Some T. noae had papillae, and some T. ninglaoo had teardrops. Of course, most T. noae lack papillae, and most T. ningaloo lack teardrops, but apparently there are a significant number of clams that have both. These are examples of clams bearing both papillae and teardrops. Images used with permission, courtesy of Kevin Cohen, Drs. Foster and Smith – LiveAquaria.com (L), Allan van Zijl (LC), and Darren Gebbetis (RC, R). At first I wondered if these in-between clams were hybrids of the two species, but again, the genes definitively say they are not. Rather there is a continuum of looks, with papillae-less individuals on one end, and teardrop-less individuals on the other. As surprising as this may be, keep in mind that T. maxima also varies greatly in appearance, as do many of the other species of giant clams. Spotted off Bali, Indonesia, this clam appears to fall right in the middle of descriptions of T. noae and T. ninglaoo. Note the row of dimple-like eyes spanning much of the periphery of the mantle, which also bears numerous teardrops and papillae, and that the shell has 5 prominent ribs. So, all of the clams that have recently been called T. ningaloo are also T. noae. Still, I imagine specimens lacking teardrops will likely be called the Ningaloo giant clam in the hobby, while teardrop-covered T. noae will be called the teardrop giant clam. With that said, below are a few things that can help hobbyists figure out who is who using easily discernable features. In most cases identification can be quite straightforward and simple. However, in some cases a combination of characters may need consideration, and it’s possible that some clams may defy identification by any means other then genetic testing. If the shell looks similar to that of T. maxima, but teardrops are present on the mantle, it’s definitely T. noae. No T. maxima have teardrops. Both species may have or lack papillae on the mantle. However, if the shell looks similar to that of T. maxima and the mantle has a preponderance of papillae, it’s almost certainly T. noae, as the mantle of T. maxima has few or no papillae. Both species may have elongated shells with 5 or 6 ribs/folds. However, if the shell has 7 it’s definitely T. noae, and if it has only 4, it’s definitely T. maxima. Also, if the shell has 6 or 7, it’s almost certainly T. noae, even if the shell is not elongated. To add to the above, an attempt by some researchers to crossbreed T. maxima and T. noae failed (Su et al., 2013). Eggs from the two species were mixed with sperm from the other, and a few were fertilized. However, it was reported that most of the fertilized eggs died the next day. Thus, the researchers concluded that the experiment supported the idea that T. noae is not a variant of T. maxima. However, a clam farmer told me they were able to successfully crossbreed T. noae with T. maxima (Romain Foki, Atoll Beauties, written comm., 2015). Using the eggs of T.noae and sperm from T. maxima worked best, but in all cases the offspring lacked teardrops. In fact, I was told that after breeding various clams for over 10 years, they were never able to produce a single clam with teardrops on the mantle. Odd, indeed. Many thanks to Colette Wabnitz, Fisheries Scientist for the Secretariat of the Pacific Community; Romain Foki formerly of Atoll Beauties; Shane Penny of the Research Institute for the Environment and Livelihoods, Charles Darwin University;Phil Dor of Tridacna Mariculture Development Consultants; Allan van Zijl of Perth Marine Giant Clam Aquaculture; Li-Lian Liu of the Department of Oceanography, National Sun Yat-sen University; Kevin Cohen of Drs. Foster and Smith/LiveAquaria.com; and Darren Gebbetis of Ningaloo Aquaria for taking the time to discuss these species with me, providing references, and/or for the use of photographs where noted. I couldn’t have written this without a lot of help from them. Borsa, P., C. Fauvelot, J. Tiavouane, D. Grulois, C. Wabnitz, M.R. Abdon Naguit, and S. Andréfouët. 2014. Distribution of Noah’s giant clam, Tridacna noae. Marine Biodiversity, DOI 10.100712526-014-0265-9. Borsa, P., C. Fauvelot, S. Andréfouët, T.T. Chai, H. Kubo, and L.L. Liu. 2015. On the validity of Noah’s giant clam Tridacna noae (Röding, 1798) and its synonymy with Ningaloo giant clam Tridacna ningaloo Penny & William, 2014. Raffles Bulletin of Zoology, 63:484-489. Fatherree, J.W. 2006. Giant Clams in the Sea and the Aquarium. Liquid Medium, Tampa, FL. 227pp. Huelsken, T., J. Keyse, L. Liggins, S. Penny, E.A. Treml, and C. Riginos. 2013. 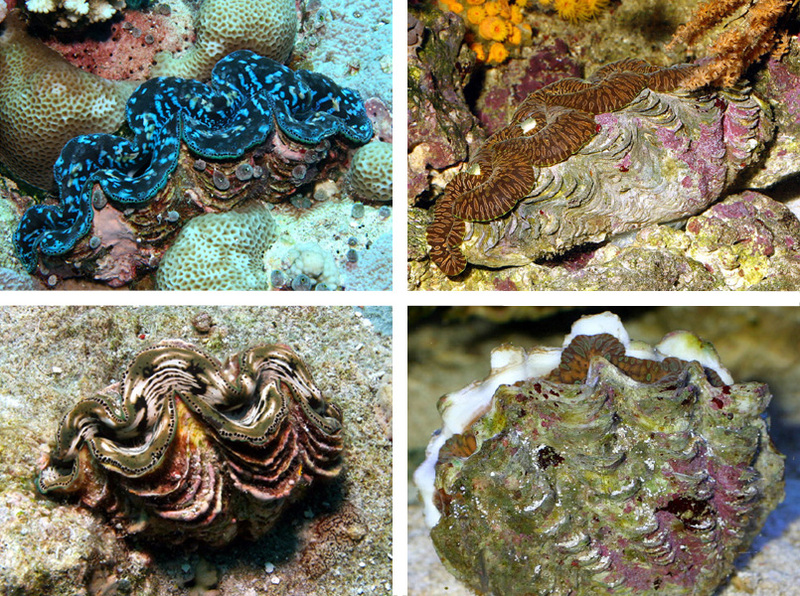 A novel widespread cryptic species and phylogeographical patterns within several giant clam species (Cardiidae: Tridacna) from the Indo-Pacific Ocean. PLoS ONE, 8(11): e80858. DOI 10.1371/journal.pone.0080858. Kubo, H. and K. Iwai. 2007. On sympatric two species within Tridacna “maxima“. Annual Report of Okinawa Fishery and Ocean Research Center, 68: 205-210. Penny, S.S. and R.C. Willan. 2014. Description of a new species of giant clam (Bivalvia: Tridacnidae) from Ningaloo Reef, Western Australia. Molluscan Research, 34(3):201-211. Röding, P.F. 1798. Pars secunda continens conchylia sive testacea univalvia, bivalvia & mulitvalvia. In: Bolten, J.F. (ed.) Museum Boltenianum sive catalogus cimeliorum e tribus regnis naturae quae olim collegerat Joa. Fried Bolten, Trapp, Hamburg. 199pp. Rosewater, J. 1965. The family Tridacnidae in the Indo-Pacific. Indo-Pacific Mollusca, 1:347-396. Su, B.W., G.L. Zhang, H.R. Zhen, Z.H. Liao, Y. Su, and L.L. Liu. 2013. The comparison of larval development of the giant clams Tridacna noae and Tridacna maxima (Bivalvia: Tridacnidae). The Omics in the Ocean – The Fifth International Symposium for Marine Biology and Biotechnology, September 17-18, Kenting, Taiwan. Su Y., J.H. Hung, H. Kubo, and L.L. Liu. 2014. Tridacna noae (Röding, 1798) – a valid giant clam species separated from T. maxima (Röding, 1798) by morphological and genetic data. Raffles Bulletin of Zoology, 62:124-135. Tang, Y.C. 2005. The systematic status of Tridacna maxima (Bivalvia: Tridacnidae) based on morphological and molecular evidence. Unpublished M.Sc. thesis, National Taiwan Ocean University, Keelung, 114pp.